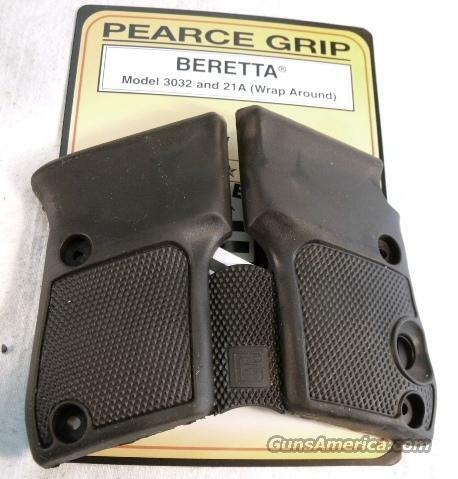 Description: GRPG32 From the fine little company that has brought us all those magazine extensions for years, Pearce Grips, come these excellent wrap-around soft one-piece rubber grips to give better traction and handling qualities to the sub-compact Berettas model 21-A Bobcat and 3032 Tomcat pistols. We southerners can spell the word Ergonomic, but we have a little more trouble saying it. Besides, that word has been run into the ground, broken off, and dug after as our McNairy County Grandmothers used to tell us. Anyway, these are fine grips, the only ones we know of manufactured to fit these two Berettas. They’re priced below their competitors from Hogue and Pachmayr, too. Own a set of the Pearce PG-32 grips in the photos	for only $ 19.00.